Way to grow! We received a free packet of Russian Mammoth Sunflower seeds with one of our Lands' End purchases this spring and decided to try to grow them. Wow, did they ever grow. 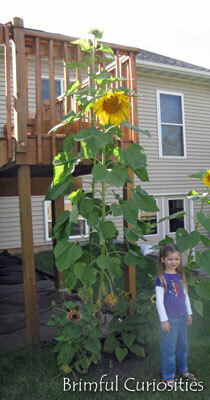 The tallest plant measured 9 ft - 9 inches last time we checked and reached as tall as the railings on our deck. btw, LOVE the Ripley's books in your last post. My son has those on his reading list every year. keeps him busy for months! Sunflowers are my favorite! I even have one tattooed on my shoulder. Beautiful photos. Happy WW to you! Look at those sunflowers, they are huge! Thank you for posting the pictures. We love seeing what became of those tiny seeds. Holy Wow! Now that's a FUNFlower! WOW! Mammoth is right!!! Beautiful. I love Lands End. 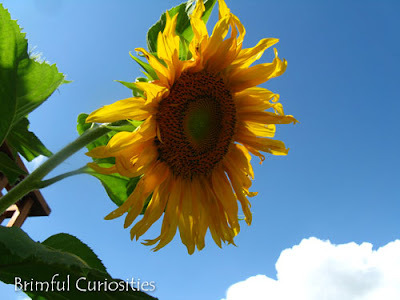 I just posted an idea yesterday for a fun lesson/activity using sunflowers. Your huge flowers would be perfect for this! It really is a mammoth and gorgeous! That is one impressive sunflower! I bet it was a blast to watch it grow. How beautiful and I hope you harvest the seeds to eat. WOW, we are studying sunflowers next week and I'll have to show my daughter how tall this is! I then uploaded the photo to picnik.com (free online photo editor) and played with the exposure until I got the desired look. It's super easy! Also, I love the hge sunflowers!!! Wow they are actually real! I love this and I'm always fascinated by them and want to grow some myself. Wowzers! That's astonishing. So glad you showed us the scale of the flowers, because I never would have imagined them that big!